After starting off with CouchDB I thought I’d create a reference card (a.k.a. cheat sheet) for myself, a bit like the one I created for proxy configuration files. As I’m rather satisfied with the result, I thought I’d share this PDF with you. 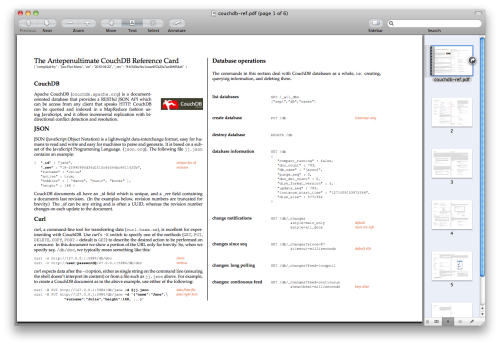 Go ahead and get The Antepenultimate CouchDB Reference Card. If you have suggestions on how to improve it, I’d by happy to hear in the comments. Update 2010-04-22: added getting documents by keys, more map/reduce, a bit of CouchApp, and a section I call “More relaxation” with pointers to related tools. Update 2010-04-24: small fixes, added links Update 2010-04-26: added replication filters and URL rewriting. Update 2010-04-29: tweaked attachments section, and added pudo. Update 2010-05-11: added update handlers.